Wolfgang Amadeus Mozart was one of the first to compose pieces for piano four hands. 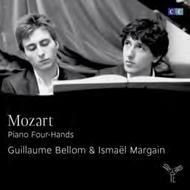 His father, Leopold, wrote in a letter of 9 July 1765: "In London Wolfgang wrote his first piece for four hands. Until that time no sonata for four hands had ever been composed". The famous Salzburg family portrait painted by Johann Nepomuk della Croce in 1780-81 (Mozarteum, Salzburg) shows Wolfgang and his sister, Nannerl, playing a duet at the piano, with Leopold, violin in hand, looking on, and his wife, Anna Maria (d.1778), included in a picture on the wall. The three works presented here were composed in Vienna in 1786 and 1787, when the young virtuoso was about to give up his career as a pianist in order to concentrate on the composition of operas, having been stimulated by his meeting with the librettist Lorenzo Da Ponte. In the summer of 1786 he composed what is probably the most ambitious and most significant of his four-hand pieces, the Sonata in F major (KV 497). It was first performed in Vienna on 4 November 1786, four months before the Andante and Variations in G major (KV 501). His last sonata for piano four hands, in C major, KV 521, was written in May 1787, when Mozart had reached his full maturity as a composer. It is characterised by the light key of C major and the virtuosity of its two fast movements (especially the first), bright and brilliant in their elegance.